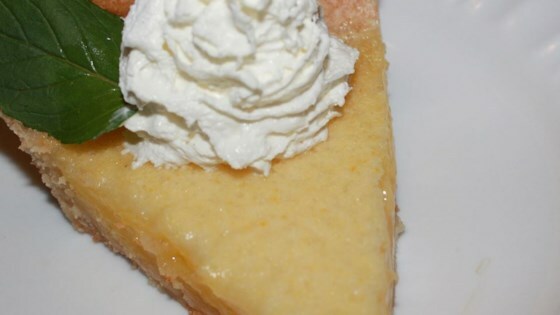 "A tangy sweet and sour treat, the Meyer lemons make it sweeter than a traditional lemon pie, but still keep that citrus kick." Place sugar, eggs, and lemon juice in a blender; blend until smooth, about 3 minutes. This is fabulous with vanilla ice cream. It can also be made as 12 mini pies - line the shells up on a baking sheet, pour and bake for 20 to 25 minutes. Very easy to make and also very tasty. Could be a little tarter, perhaps. I wonder if it might taste good with a shortbread crust instead. But as-is, an excellent, easy choice. Delicious pie, wonderful for after a big dinner as it cleanses your palate and leaves you satisfied.